Simply be. Drop this urge to constantly become this or that. Life simply is. There is really no objective to Life; there are no goals to be achieved, no responsibilities to be fulfilled. Nothing. You are born. You live. You die. Period. This is the truth – so simple, so uncomplicated. It is only society that brings in expectations of goals and outcomes, and labels of success and failure or joy and sorrow. You take away the social denominators from Life – starting with money – and suddenly Life simply is. Our friend, and his wife who was with him, were hardly able to comprehend what I meant. They smiled and waved their goodbyes and walked away. I can understand what they must have been thinking about – “how can anyone not be doing anything?” And they are not alone. I believe the whole of humanity thinks this way and so is missing this beautiful opportunity to just be in the moment – because everyone is trying to become someone, by trying to do something or the other. I am not saying you must not work or that you must not earn money or that you must not raise a family. But don’t get so caught in earning-a-living that you miss the opportunity to live itself. Look at nature around you. The trees, the birds, the flowers, the river, the ocean, all of them simply are. They have no concept of time nor do they have any targets or goals to achieve. It is only man who has time-bound goals in focus. Nothing wrong with that. But if the same goals start haunting you, when they make your Life miserable, then you have a problem. Earning money is not a problem. But complaining or worrying that you are not having enough is a problem. Working is not a problem. But feeling stressed out over your work is a problem. Having a family is not a problem. But sweating over the behavior of your family members is a problem. The nub is this: to live your Life fully, celebrate each moment. Simply be. Drop this urge to constantly try and become this or that. Don’t try to desperately make a meaning out of your Life. Meaning is a social requirement. 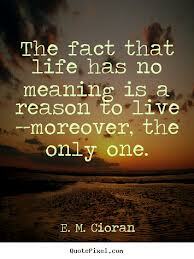 Life doesn’t care about any meanings. So, why don’t you also live your Life for what it is, as it is? Don’t seek meanings. Don’t get keyed up. Don’t complain. Be alive, be with your Life – as is! Author AVIS ViswanathanPosted on October 31, 2015 March 14, 2016 Categories Art of Living, Be, Becoming, Celebrate Life, http://schemas.google.com/blogger/2008/kind#post, Inner Peace, Intelligent Living, Live in the moment, OshoLeave a comment on Simply be. Drop this urge to constantly become this or that.